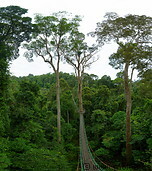 The Danum valley conservation area was established in 1981 for the purpose of rainforest-related conservation, research, education and recreation. It consists of 438 sq km of primary dipterocarp rainforest located around the Danum river 65 km to the west of Lahad Datu and is owned by the Sabah foundation. While there probably is lot of wildlife in the area, it is very difficult to see any wildlife. In the two days I spent there, staying in the Borneo rainforest lodge, the biggest animal I saw was a pheasant-like bird walking around - the other animals I saw were just insects. When driving back to Lahad Datu we spotted the orangutan in picture 25, several hundred of metres away from the road on a tree. A much better place to spot wildlife is the Kinabatangan river area.